We all play various games in our life. Right from the childhood, when we used to play outdoor games way back in the 80’s and 90’s to the indoor digital games which we play currently. The games included Cricket, football, Badminton, Chess etc in those days whereas currently all these games are digitized. Digitization of games has its own advantages and disadvantages. The main disadvantage is that we tend to reduce the movement of our body, which normally we associate with these games. But the advantage is that we get to play against the world community as against the local community. This can help us develop our skill in a particular game, much better. This is mostly true for certain indoor games which require more use of brain than muscle. No one can replace physical sports like football with digitized games and yet maintain the level of physical involvement required. Or may be I am wrong, time will tell. 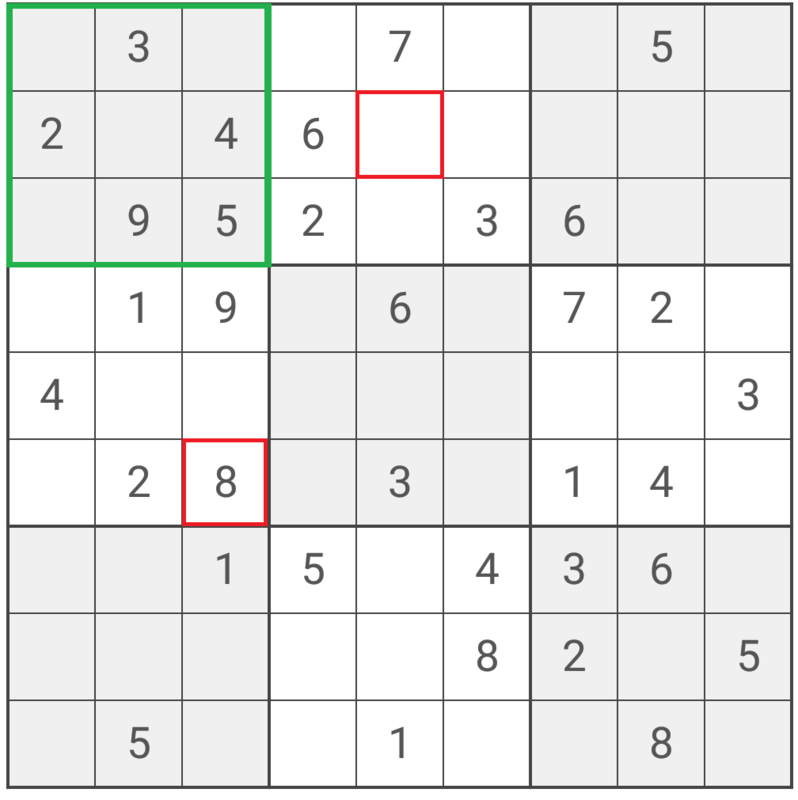 Here in this post, I will help you learn to play Sudoku. 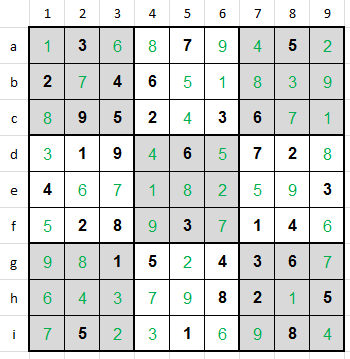 Sudoku is primarily a number game. It involves use of basic math reading, no calculation required. If you know which numbers lie between 1 and 9, you qualify for taking this lesson. 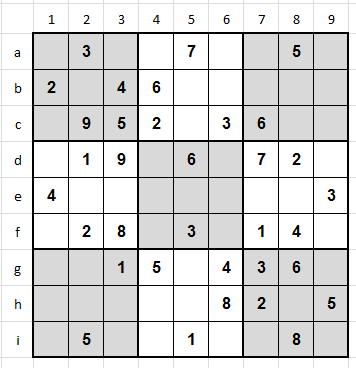 Sudoku primarily appeared in newspapers but programmers have digitized this game. They have also added certain difficulty measures to it, one of them being time constrain. Playing Sudoku under time constrain will help you in improving your logical thought process and keeps your brain active. This also helps reduce the chance Alzheimer. And it’s fun too. 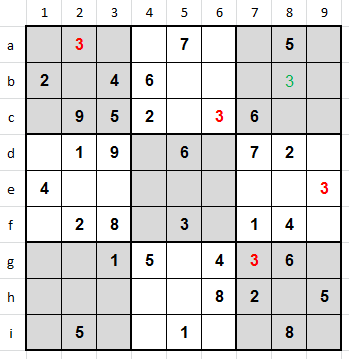 Once you launch Sudoku in your computer or mobile phone, the screen will show a square subdivided in to 9 equal sub-squares. Each of these smaller squares are further subdivided in to 9 equal cells. 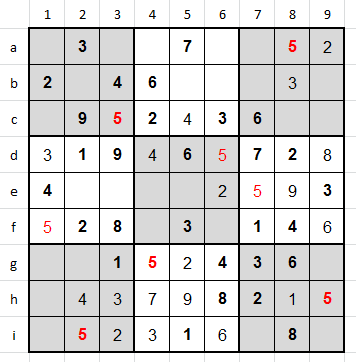 This 9 X 9 configuration is a standard configuration in any version of Sudoku. Refer picture on left. You can see few digits entered in cells. Note that the numbers are completely random. But still there exists a logic in their placement. You will understand it once we move ahead. As you can see, the big outer square is sub divided in to nine smaller sub-squares. I have marked one of them in green. Each of these smaller sub-squares is subdivided in to nine smaller cells. I have marked two of them in red. We must fill up the blank cells to complete the puzzle. Each sub-square(green) must contain the numbers from 1 to 9 without repetition. Also, each vertical column must contain the numbers from 1 to 9 without repetition. And each horizontal row must contain the numbers from 1 to 9 without repetition. Straight forward,isn’t it? It is if you follow certain tips and tricks. The level of difficulty you select while launching the game defines this. The difficulty level depends more on which cells are pre-filled with respect to blank cells rather than the number of pre-filled cells. I suggest that a new user should start with easier levels, to get a hang of it. For the sake of explanation, I have numbered the cells as below. If you use excel, you will be very familiar with this cell address scheme. You may or may not see this numbering scheme in the game depending the developer. We refer to the first row first column as a1, first row second column as a2 and so on up to i9. This game is played using the process of elimination. First of all, look up for any sub-square which has the maximum pre-filled digits. You can see in our example above that there quite a few sub-squares. Pick up any one of these sub squares and start counting from 1 to 9 while checking which number is missing. Let’s say the we are playing with the very first sub-square contained by the cells a1 to c3. We see that the number 1 is missing. There are 5 empty cells in the square a1-c3. But when we take in to consideration the rules, only two cells qualify to accommodate the number 1. These cells are a1 and c1. The cell b2 cannot contain the number 1 because the cell d2 contains the number 1. Similarly a3 cannot contain the number on because the cell g3 contains the number 1. If we place the number 1 in b2 or a3, this would be repetition, which is against the rules. So now we have the cells a1 and c1 where we can possibly place the number 1. But there is no way at this moment to tell where we should place number 1 without having a conflict in future. So we move forward. Counting ahead, numbers, 2, 3, 4 and 5 are already present in the sub-square. Number 6 is not present. We can place number 6 in either a1 or a3, but we are not sure even in this case whether there will be future conflict. Same is the case with numbers 7 and 8. Number 9 is already present in the sub-square. So we move forward to analyzing sub-square a4 to c6. In this, while counting we find that numbers 1, 4, 5, 8, 9 are in same situation as previous sub-square and numbers 2, 3, 6, 7 are already present. We keep on moving forward among these sub-squares. In sub-square a7-c9 we are able to fill in number 3 at cell b8. This is because it is the only cell which allows the missing 3 to be entered without conflicting with all the already present 3s highlighted in red. We can keep on analyzing in this way and we come up the final result as below. Since we have entered few numbered in blank cells in the first iteration, we have to go back and carry out second iteration. Since we have filled up some numbers, they might help us to determine those cells where we not sure previously. We keep on repeating these iterations till we are not able to enter any single number in the entire iteration. The final matrix after multiple iterations in example above is as below. Since the difficulty level for the puzzle above was easy, we solved this by analyzing the sub-squares. But as the difficulty increases, analyzing the sub-squares alone will not be sufficient and in such case we need to start analyzing using rows or columns method. Let’s say we tried iterations number of times but were unable to fill up the matrix as below. Then we can go for the next method. In this case we start analyzing either each row or each column, one by one. Let’s pick up column 1. We again start counting and checking whether the numbers 1 to 9 are present in that column. If any number is absent, we search for the possible cell where we can fill that number. This is done by checking the corresponding row for each cell. For example, if we want to check if we can fill a missing number, let’s say number 1 in the above case, in cell a1, we check cells a2- to a9 for the presence of number 1. If number 1 is not present in cells from a2 to a9, then the cell a1 becomes a possible location for number 1. Now we need to check for any other possible locations in column 1 where we can place number 1. If there is only one cell location in column 1 where we can fill the number 1, then we should fill it. If there are more then one possible locations to fill in the missing number 1, we can’t fill it and we should move ahead analyzing the next number. Once we analyze one column, we analyze the next column in the same way. We can continue this for number of iteration till we either solve the puzzle or we are not able to fill up any number in a single iteration. Once we are not able to fill up any number in a single column iteration but are are left with blank cells, we should start analyzing rows. Analyzing the rows and filling them ups is same as analyzing the columns as explained above. In this we check the possibility of filling up each cell of the row by cross checking them against the corresponding column. Once done with one row, we mode on to the next row. Another method which we can use along with the above three is singling out an individual number and checking their position in the matrix. This method, though similar to analyzing each sub-square, is different from it because in this method, we analyze a particular number. The presence and position of this number in corresponding horizontal and vertical sub-squares determine the position in the sub-square where it is not present. Let’s take an example of number 5. You can see that the number 5 appears in each sub-square except in the sub-square a4 to c6. There are four cells empty in a4 to c6. These cells are a4, a6, b5 and b6. Cell a4 abd a6 cannot contain number 5 because cells g5, a8, d6 conflicts. Similarly cell b6 cannot contain number 5 because cell d6 conflicts. So cell b5 is the only cell where we can place number 5. This analysis can be done starting from number 1 to 9 in sequence. We can even opt for mixing these methods instead of carrying out multiple iteration of each method. For example, we can start with analysis of rows, complete one iteration then move to next method, say column analysis for one iteration and then sub-squares for one iteration and number analysis. Mixing and matching can keep things interesting. 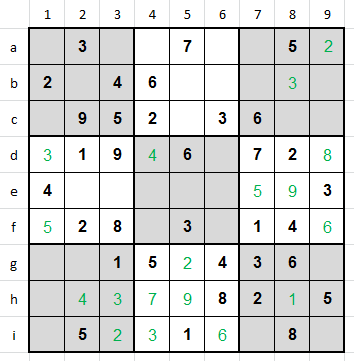 So you see, Sudoku is not a difficult game. It just needs few tricks and some practice. 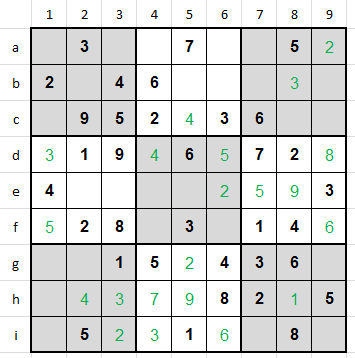 If this article has helped you learn Sudoku, kindly share it across. Leave comments if any help needed.